Hockey For Grace In The Media! Thank-you to Snapd Newmarket who came out to help celebrate and cover Hockey For Grace. They did a great spread in the May edition, check it out here. The Era Banner came out to our fun at National Training Rinks on Saturday April 1st to cover the inaugural Grace Manning Memorial Hockey Tournament. Check out their great article about our event here. We were very excited to talk about The Grace Manning Memorial Hockey Tournament and Charity Social Presented by The Arts with Jeff Lang on 105.9 The Region Thursday morning. We’re exciting to have Jeff playing in the tournament and a big thank-you for taking the time to talk about and share #HockeyForGrace with his listeners. Missed the interview? You can check it out here. We were honoured to be on Hearts of Hockey’s latest podcast to talk about The Grace Manning Memorial Hockey Tournament & Charity Social and are very excited to have Caleb and Amy coming out to cover and volunteer for the event. Check out the podcast. 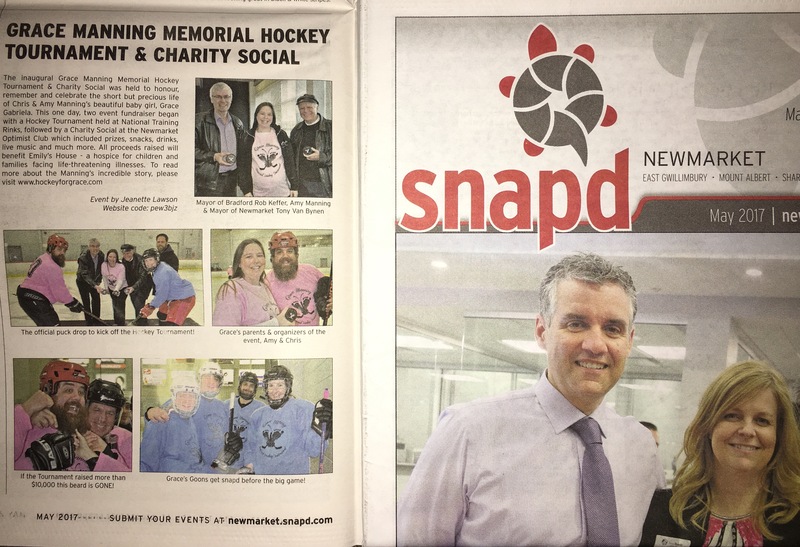 We are so excited for our upcoming Grace Manning Memorial Hockey Tournament & Charity Social happening April 1st and very thankful to The Bradford Topic for sharing our story and event info. Check out the article here. On March 1st we were honored for Chris to get some time on Sirus XM Canada Talks with Jeff Sammut to speak about The Grace Manning Memorial Hockey Tournament and Charity Social Presented By The Arts Music Store and Emily’s House Children’s Hospice. A big thank-you to Jeff and his team for this opportunity! If you missed the interview you can check it out here. Love seeing where Grace gets to go. A big thank you to @kelsylyne for sharing this photo in her #hockeyforgrace tee. Want one? We still have a few left, just $20. Email hockeyforgrace@gmail.com to get yours!